JoumReab Sour, hello ladies and gentlemen, let me introduce myself. My name is Chheuy Haklao, and you can call me Lao. I was born in 1996 in Banteay Meanchey province. At the age of 14, I moved to live in the Buddhist monastery with the monks because of education of high school. In August 2014, I graduated from high school. 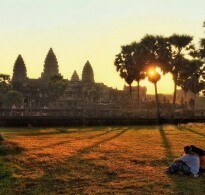 Then I moved to Siem Reap for Bachelor Degree. After one month living here, I found the high demand of tourism, and I started doing Hospitality management course for one year (Oct 2014 – June 2015) during the day. In the meantime, I have also been doing Bachelor Degree in English for Education at night. Now I am in year III, Semester II. On the other hand, I have taken many of English courses such as: writing, listening, reading and speaking skills. Moreover, I used to be a teacher of English writing skill. Through this, I have an advanced level of English communication. 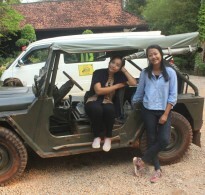 In 2015, I pass a tour guide exam prepared by Cambodian Ministry of Tourism, and I got trained for 6 months including 2 months’ internship in the tour company. 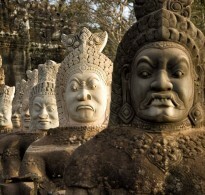 I have been guiding travelers to Angkor Complexes and all over Cambodia. I specified on historical, cultural and adventurous tour (countryside cycling and hiking on the mountain. I really love this job in terms of sharing stories about my beautiful country and its rich culture. About my family, I have two younger sisters who are 13 and 18. My family is in the country 50 km from town. My mother is a farmer, and so are my grandparents. I have been struggling with the difficulty of life since I was in very early age. I am young, but my professionalism is not!